Amazing customer oriented Food delivery orderings apps development company services for your any kind of your food business model. Our team has extensive experience in Food business domain ranging from a simple website for Restaurants to extensively featured web portal & mobile app for your Food ordering & delivery management. You will feel distinctive comfort while working with us. We first understand your needs & what best work for your business objective then proposes you a peculiar food ordering & delivery app solution that gives actual results. Our Team of professionals has expertise in providing design & development services for On Demand Food Delivery App Development Company, Food Delivery Mobile App Development Restaurant, Table Reservation Mobile App for Restaurant, Multi-Restaurant On Demand Food Delivery web & mobile apps development. User-friendly custom & unique designing services for your Food business Website & Mobile applications. Our Food app developers have expertise in developing Food ordering websites & Food portals for your Food business on different business model. Mobility is a key in the modern digital world, Get your mobile apps today to capture the attention of your customers who are spending more time on their mobiles as compare to the desk systems. iOS is a popular smartphone platform in the western countries. 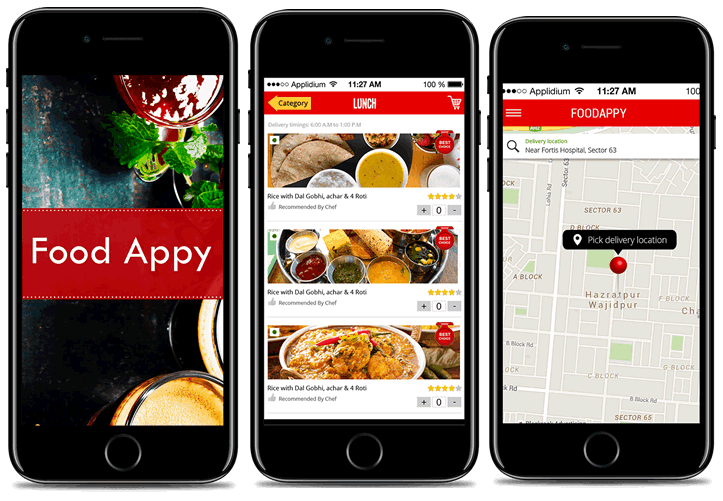 Get your Food mobile app developed on iPhone today. Android is a popular smartphone platform for the masses. Get your Food mobile app on Android today. Developing a custom Food applications is our team expertise. Discuss your specifications today. Just have a glimpse of some ideas of features for On Demand Food delivery mobile apps for your food business. These are the selected features apart from the regular traits of Food Delivery web or mobile Apps for the Food joints. Have a look and see if something makes you interest. We can further serve you with a more detailed version of the solution as per your audience and business needs. Send special offers & news to selected customers on mobile. Reward Wallet mobile app to give ledger on mobile app to see earned reward points. The customer selects his favorite dishes and order via mobile app and makes online payments. Delivery guy gets order notification on mobile app & update delivery time. Wireless technology to spread advert & log customer check-in in your restaurants. A customer can make table reservation via mobile app to avoid a standing queue. The customer can place the order from his table. No need to take manual orders. The kitchen gets order directly without any need of waiter’s manual intimation.